Zynga (NASDAQ: ZNGA) is a hot stock again. After years of trading in a range following its fall-out with Facebook (NASDAQ: FB) a few years, ago, Zynga’s pivot into the mobile gaming market is paying off in a big way, and it’s reviving Zyna stock. Not only are established titles holding up but the company’s path forward is clear. Recent acquisitions plus a shift away from ad revenue and towards user pay will complete Zynga’s turnaround story. Even at new 52-week highs, with valuations on the higher end of the spectrum, investors will probably win on the bet that Zynga will report profits accelerating. Zynga reported bookings growth of 19.4%, to $267.3 million. GAAP EPS came in flat at $0.00, meeting estimates. Operating cash flow of $90 million is highly notable because it is the best performance since Q4/2011, back when the gaming firm relied on the Facebook platform for its games. Zynga’s biggest revenue driver is from mobile revenue, which grew 12% Y/Y to $228 million. Mobile bookings grew 26% to $248 million. Zynga’s mobile revenue split tells two different stories. User pay revenue grew 8% to $158 million, compared to the 23% Y/Y growth for mobile advertising revenue of $69 million. Importantly, due to the global economic slowdown and a shift in consumer habits, the company expects gross margin pressure for 2019. Unfortunately for investors, Zynga will post less detailed metrics going forward. Even though Apple (NASDAQ: AAPL) stopped reporting iPhone unit counts, sending the stock lower at the time, markets were not concerned with Zynga. The positive cash flow is not the only strong number that investors should like. The company has $581 million in cash, cash equivalents, and short term investments, with $100 million in debt outstanding included, net cash is $481 million. Add back the $100 million in the revolving credit facility remaining because that would give the firm the funds it might need to make acquisitions. Zynga is looking at other ways to increase its cash reserves for this purpose. This includes a potential leaseback of its San Francisco building, plus more debt financing alternatives. Zynga has a decent track record for growing its business through acquisitions. Its buyout of Gram Games and Small Giant Games closed recently. Not only does it gain talented staff, but it adds two franchises to its portfolio: Merge Dragons! and Empire & Puzzles. Small Giant is fundamentally strong because it is growing organically. High levels of marketing investments have an incrementally better rate of return as a result. Investors should still expect the operating margin growth of over 20% will happen eventually, probably in late 2019 into 2020. Zynga is exercising constraint with how much it is investing in Small Giant. If the overall business grows at a better pace, look for the firm increasing its marketing and operating expenses spend. For 2019, these acquisitions will give bookings growth a boost over its revenue growth. Empire & Puzzles will launch in the second half of this year and will add a whopping $200 million in net increased deferred revenue. The Revenue Multiples Model crunches out a 20% downside for the stock. In this approach, Zynga has unfavorable valuations compared to Electronic Arts (NASDAQ: EA), Take-Two (NASDAQ: TTWO), Glu Mobile (NASDAQ: GLUU) and Activision (NASDAQ: ATVI). Zynga’s forward EV/Fwd. 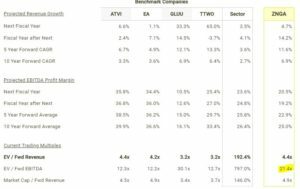 EBITDA is 21.4 times, compared to Activision or EA at 12.3 times and 12.2 times, respectively. Article printed from InvestorPlace Media, https://investorplace.com/2019/02/these-catalysts-make-zynga-stock-a-buy-2019-and-beyond-nimg/.